Giambattista Pamphili was born in Rome in 1574, the son of a well-established family from Umbria. 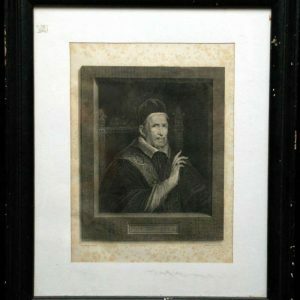 His uncle, Cardinal Girolamo Pamphili was his mentor and after graduating in law in 1597 from the Roman College, he began a career in the Curia. He was twenty-three years of age. From 1604–1621, Pamphili was a judge of the Rota, the Supreme Court or tribunal of the Church. 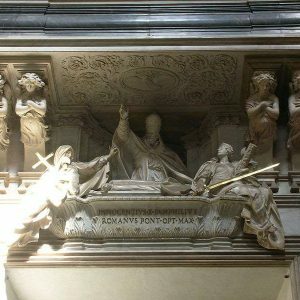 While there he became a friend of Allesandro Ludovisi, the future Pope Gregory XV. Because of this friendship he was made nuncio in Naples. In 1625 he accompanied Pope Urban VIII’s nephew as legate to France and Spain. 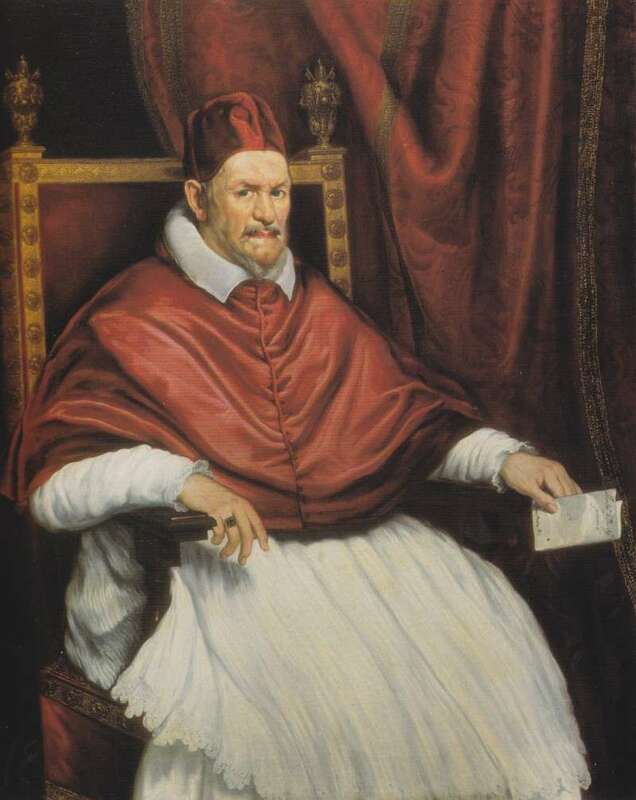 In 1626, Pamphili became nuncio in Spain and within a few years Urban made him cardinal. He was fifty-three at the time. In 1644, upon the death of Urban VIII another contentious conclave lasted thirty-seven days. The French and Spanish were again pitted against each other and Pamphili was elected in reaction to Urban’s pro-French tendencies. Innocent X, as he chose to be called, was favored by, and sympathetic to, the Spanish whom he considered less of a threat to the Papal States than the French. The French Court’s all-powerful minister, Cardinal Mazarin, attempted to veto the election but arrived too late to do so. The new pontiff was seventy years old at the time of his election and would rule for eleven years. One of his first actions was to strip Pope Urban VIII’s Barberini relatives of their lands and possessions. Their reaction to this was to flee to France to seek Cardinal Mazarin’s protection. 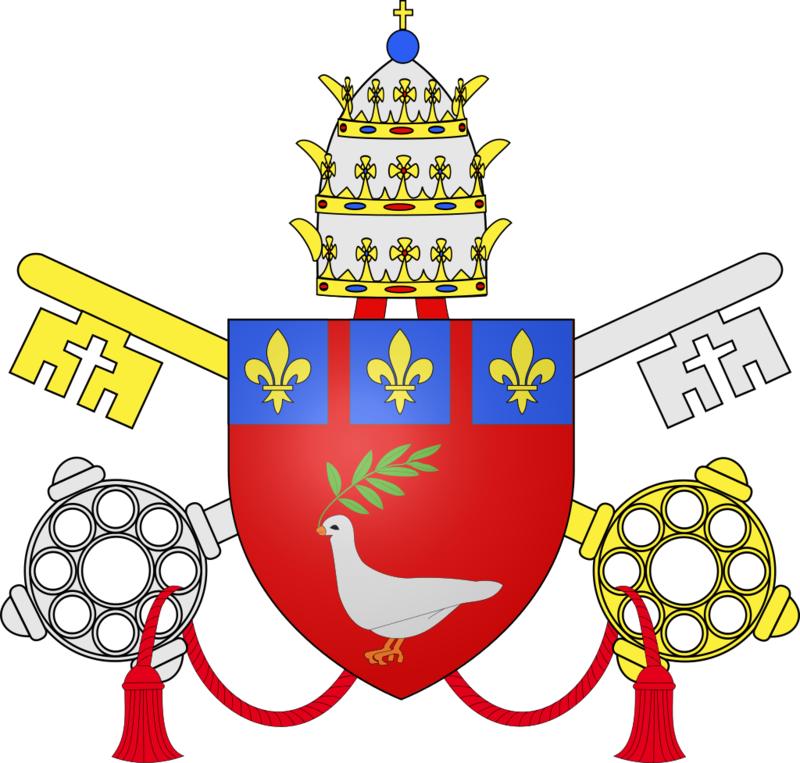 Mazarin forced the new pontiff to pardon them or face a military threat in the Papal States. Innocent acquiesced and pardoned them. But Innocent himself was not immune to nepotism and soon bestowed wealth and titles and offices on members of his own family. 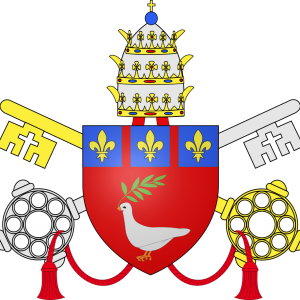 From the time of Pope Paul III until late in the 17th century, this was usually the nephew of a pope. None of Innocent’s nephews proved capable of fulfilling this role. Instead, someone very powerful entered the papal court. This was Donna Olympia Maidalchini, his sister-in-law, and a person of great ambition and greed. Wikipedia quotes the Encyclopedia Britannica about Maidalchini. Throughout his reign the influence exercised over him by Maidalchini…was very great, and such as to give rise to gross scandal. However, there appears to have been no adequate grounds. The avarice of his female counselor gave to his reign a tone of oppression and sordid greed, which probably it would not otherwise have shown, for personally he was not without noble and reforming impulses. As it was, Maidalchini became the most powerful person in the Curia, the one whom ambassadors, cardinals and bishops approached if they wanted anything from the pope. Her greed was legendary even to the point of taking grain and rations from the poor during the 1647 – 1648 famine. Eventually, Innocent had had enough of her and sent her away only to recall her to court to keep order. At eighty years of age, Innocent could not rule without her intervention. In 1651 he gave the post of secretary of state first to Cardinal Panciroli and later, to Fabio Chigi, the future Alexander VII. Chigi had an important role in that he was the first among the recognized secretaries with whom nuncios and legates corresponded directly. Additionally, the secretary even signed letters and instructions on behalf of the pope. It was Cardinal Chigi who acted as the pope’s representative at the congress ending the Thirty Years War (1618 – 1648). While the pontiff and his representative bitterly opposed the concessions they had to make to Protestantism, Emperor Ferdinand III and Maximilian I of Bavaria deemed the concessions unavoidable. The Peace of Westphalia, therefore, is notable, from a Catholic perspective, for its demonstration of the waning of papal influence on the politics of the time. While Catholics would recognize the pope as the head of their Church, the voice of the pontiff would cease to carry its past weight with the monarchs of Europe. In Spain and France, their Thirty Years’ War, while officially over, was still causing bloodshed and violence, a cause of grave concern to the pontiff. He still considered Spain less of a threat to the Papal States than France. In Spain, Portugal broke away during the revolt of 1640. Innocent didn’t condemn Portugal’s revolt but refused to recognize Portugal’s monarch or any of his nominees as bishops. Consequently, there was for a time only one bishop in Portugal. Innocent also took the side of Spain when Naples revolted against them. This was a ‘balancing act’ he undertook to sidestep growing French control in the area. Innocent gave financial aid to both Venice and Poland in their struggle against the Turks as well. His papacy seems to have been characterized primarily by political matters, but ecclesiastical issues were also important. He was known for giving strong support to foreign missions, for founding a college at Ravenna, and for raising the status of a college to a university in the Philippines. But the greatest issue he faced in matters of faith concerned the condemnation of Jansenism, which was the extremist views of St. Augustine’s teaching on grace and free will. Innocent even took part in several sessions of a commission he established to examine their work. In the end it was unconditionally condemned and before his death, the French government agreed with him which served to contain the spread of this heretical movement. He also reformed monastic life in Italy by combining smaller houses. He reorganized the prisons in the Papal States providing the most humane treatment for prisoners up until that time. Innocent was financially cautious. 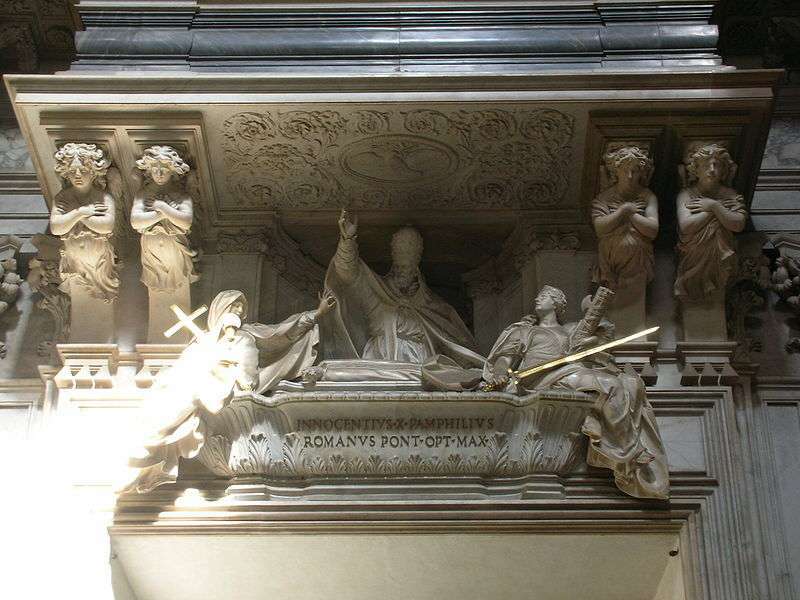 He did not embellish Rome to the same degree as his predecessors but the interior of St. Peter’s was completed as well as the Piazza Navona, and the Palazzo Pamphili, the home of Pope Urban VIII, was restored to its ancient form. Several other edifices were erected as well. Innocent died a rather slow and agonizing death that allowed his relatives to loot and to transport the papacy’s wealth elsewhere. None of his relatives felt in any way obligated to bury him. He was buried at someone else’s expense in the simplest style imaginable. Eventually, a nephew erected a monument in his memory at the church of St. Agnes. Innocent’s successor, Alexander VII ordered Donna Olimpia to leave Rome and she died of the plague in 1657. There is an interesting story connected to Diego Velazquez’s portrait of Innocent shown with this history. 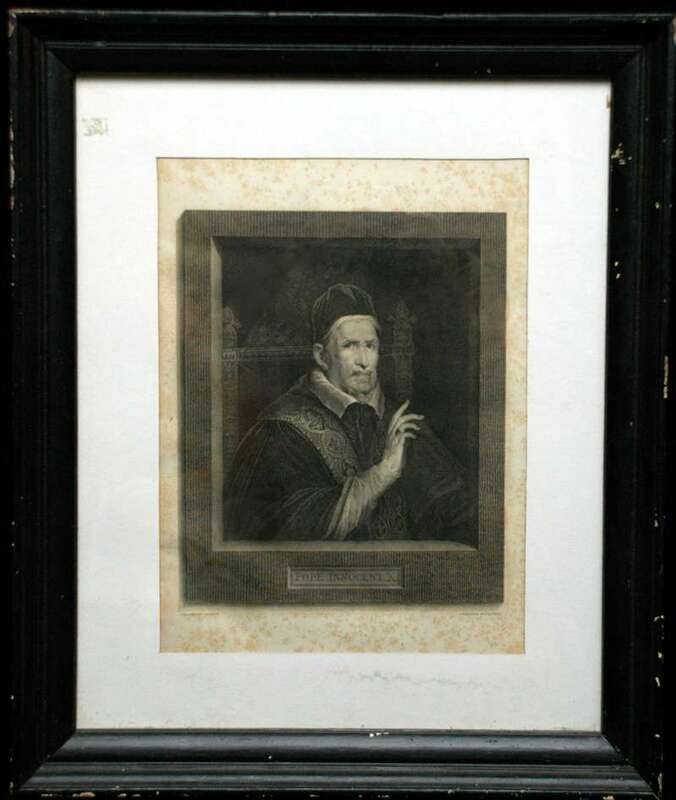 Unlike his predecessor, Urban VIII, who patronized Bernini throughout his papacy, Velazquez traveled to Italy at the behest of Philip IV and this portrait is the only one he did of Pope Innocent X. Velazquez was the Spanish court painter and renowned as a portrait painter. St. Peter and the Vatican, The Legacy of the Popes, states that The pose of the sitter in the armchair, or on the throne, always conceals an allusion to the “cathedra Petri” that was the prerogative of the pope. In Velazquez’s portrait, Innocent X sits in a tense and vigilant pose. In his left hand he holds a letter and through steely blue-gray eyes he directs a searching glance at the observer. His expression and pose betray intense concentration. The realistic portrayal of the large fleshy nose, the narrow compressed lips, and the sparse beard do not make the face particularly appealing. Yet Velazquez, in his extremely vivid portrait, endows the pope with a detached aristocratic dignity. Velazquez remained in Rome only for a short time, and his connection with the pope consisted only of this single commission. In contrast to Bernini with Urban…he could not explore the pope’s personality in the course of a long confidential relationship. Yet in this portrait he gave proof of a genius for observation and penetration: he seems to have grasped the essence of the pope’s character in a quite objective way.